On the day of the talent show, a boy is ready to sing his song, and he isn't one bit scared because he has practiced a billion times, plus he's wearing his lucky blue boots and his pants with all ten pockets. But as all of the other kids perform before him, he gets more and more nervous. How the boy overcomes his fear of performing in front of the class makes a charming and funny read-aloud, complete with ten novelty flaps to lift. 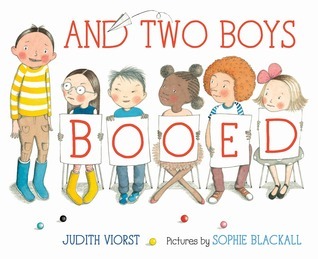 And Two Boys Booed is a very cute picture book for young readers. I love the interactive flaps that reveal fun surprises to the already engaging illustrations. The repetition and subtle rhymes make this one kids will want to read again and again, maybe even memorize! I also love how the boy's words get mixed up when he is nervous; the result is a hilarious paragraph that both boys and girls will love. I think anyone can relate to this story of a little boy with a severe case of nerves when he has to sing a song at the talent show! Then again, what else do you expect from the author of Alexander and the Terrible, Horrible, No Good, Very Bad Day? I hope And Two Boys Booed becomes a beloved classic for generations to come, like Alexander is for me.